Learning how to paddleboard oceans, lakes and rivers is one of the most enjoyable things about the sport – there are SO many different bodies of water to try out! Where you live or where you are traveling might affect your options at the moment, but no matter where you live, there are almost always rivers and lakes nearby. If you happen to live near the ocean you’ll have endless options to explore. Although we’ve referred to our planet as “Earth,” a Germanic word which means “the ground” for at least 1,000 years, almost 70% of it is covered by water! To keep it simple, all of that water can be broken down into three major categories rivers, lakes, and oceans, but if you’re interested in what’s the difference between things like a firth, fjord, and a freshet head here for an enlightening read. 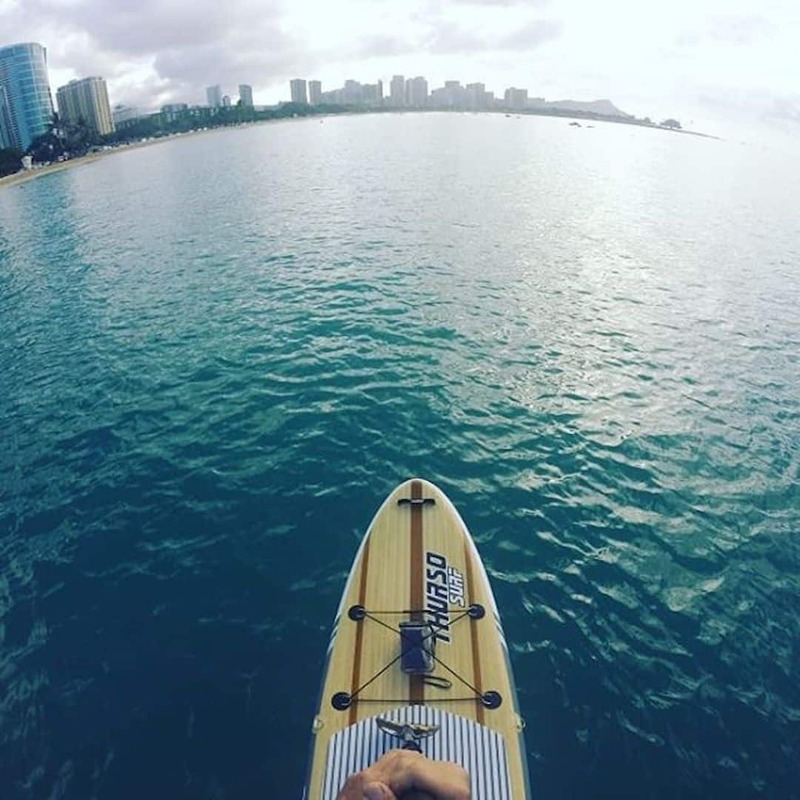 Inflatable paddle boards are one of the most fun ways to tackle any body of water. To get things started we’ll begin with the two most common bodies of water ventured by paddle boarders, oceans and lakes. Then we’ll head over to rivers. Compared to lakes, ocean conditions can vary widely depending on the wind, the weather and the tides. Beginners should start out in protected inlets like bays, coves, marinas or harbors where the conditions are much more predictable and flat water is easy to find. You can also pick a calm day to get started. 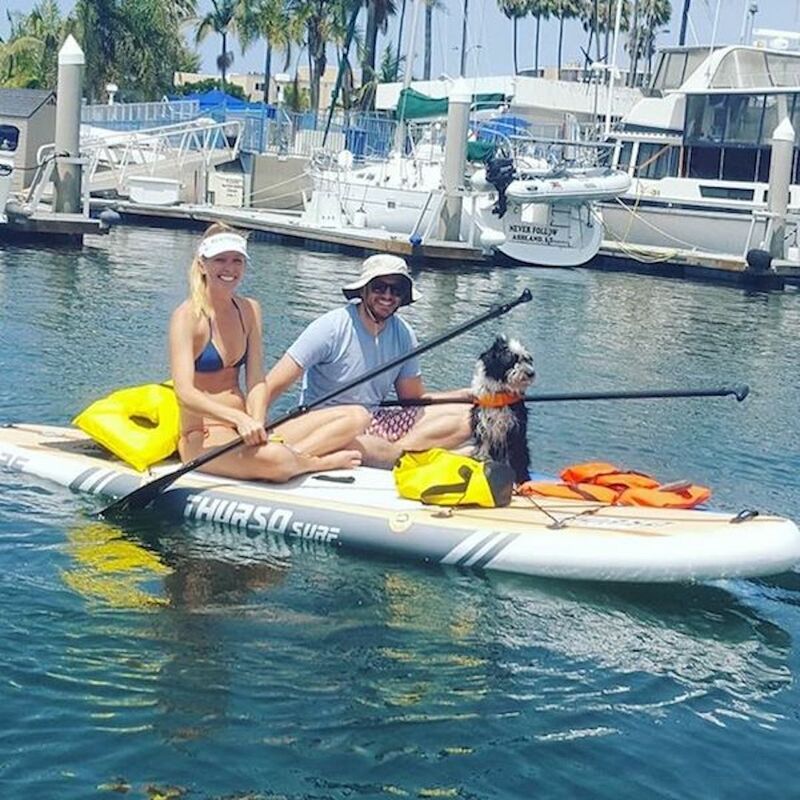 Flat water ocean paddling is open to a wide variety of activities including touring, fitness, yoga or just splashing around with family and friends. 📸 @amynkramer enjoying some flat water paddling in Marina del Rey, California. Any board shape will do! 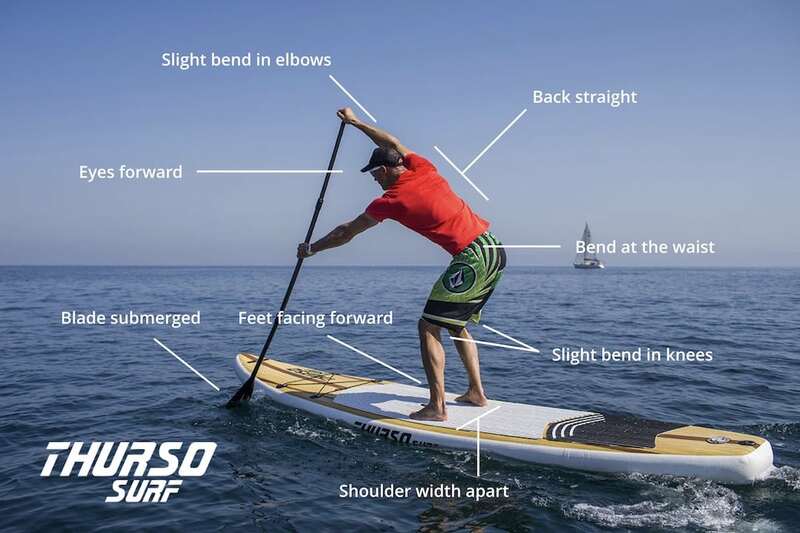 For flat water paddling the activities you’re planning are more important in choosing a board than the conditions. An all-round shape like the Waterwalker will offer you the most versatility. A touring shape like the Expedition will make the distance glide by. For a stable fitness or yoga platform, choose a yoga board like our Tranquility SUP. If you’re planning to surf, follow the coast or paddle further offshore, it’s important to check the local conditions (weather, winds, tides, swell, etc.) leading up to your trip and again immediately before you set off. While stand up paddle boarding is usually the most fun on a beautiful sunny day, oceans can be impressively unpredictable. There’s a reason the english language has so many allusions to oceans and transformations like the phrase ‘sea change.’ Taking the time to check the conditions will help you better determine what type of gear you should wear and what to bring along with you. Although you can enjoy small frothy waves on any board, if you’re surfing or playing in the waves an all-round shape is the best choice. All-round boards like the Waterwalker are wider than a touring board and feature a rounded nose to give you a bit more stability and maneuverability in the waves. Paddling Expeditions along the coast in the Gulf of Trieste in the Mediterranean Sea. As previously discussed, ocean conditions vary significantly. However, if you’ll be tracking the coast or paddling out into rougher waters over longer distances it’s best to opt for a touring board. Touring paddle boards like the Expedition have a pointed nose and are narrower and longer than standard SUPs, giving them more glide. That means you’ll paddle less to go further. In addition, their distinct shape and layout improves paddling efficiency, tracking and overall performance when paddling through chop. Lakes offer a similar experience to ocean paddle boarding, but are often much easier to find your balance on. 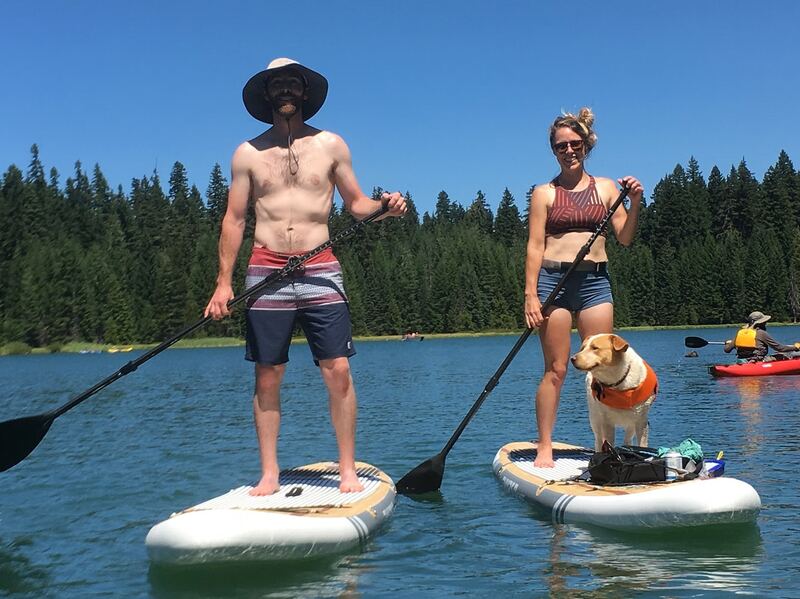 You may have already picked up on why, since lake paddle boarding is often referred to as flat water paddle boarding. That’s right, because of their smaller size and land enclosure their conditions on lakes tend to be smoother and quite a bit more predictable. That makes lakes a perfect place for beginning paddle boarders to start out. In most lakes there aren’t any serious tides or currents that can lead you astray. However, strong winds can occur so it makes sense to keep an eye on the weather. For any outdoor activity it’s always best to know what to expect before heading out. 📸 @lindseyvvvvvv and her paddle crew out on Timothy Lake, Mt Hood National Forest. Rivers are another great place to paddleboard. They can be dynamic with a fast current or even white water with conditions that are similar to oceans or they can be flat and slow which makes for a relaxing scenic paddle more like what you’d find on a lake. The key differences a stand up paddleboarder should consider is the river’s current as well as the weather conditions. When checking the forecast before paddling on a river, look for indicators that could change its flow. Seasonal snow melt or a recent rain or storm upstream can drastically change the current, depth and even the width of a river. Rivers’ continuous current also makes falling off a much different and more common experience than on flat water. In a river you must consider what lies ahead and options available for getting back on board. Trying to climb back up in rushing rapids is a significantly different experience from climbing back up on a calm river bend or even an ocean swell where you can swim out of the break to calmer waters before mounting back up. If you fall off in the rapids, rely on your life vest to help you float on your back and keep your feet pointed downstream. This way you can use your legs to absorb the impact of any rocks or logs you might be headed into. Once you’re floating on your back, use your leash to get close to your board. Then pull yourself up. You will also most likely encounter a variety of obstacles on rivers that you aren’t as likely to find in the deeper open waters of an ocean or a lake. Before heading out, take the time to find a section of the river that’s suitable for your skill level and intent. Shooting the rapids can be fun, but requires different gear like a life vest and a properly fitted helmet designed for whitewater. A speaker, deck cooler bag and belt-style PFD are more appropriate for a lazy river paddle. Lastly rivers tend to have a rocky bottom or feature debris like trees. You need to be cautious of anything that breaks the surface as well as all of those out of view below. Keep an eye out for ripples disturbing the surface of the water that may indicate submerged debris as you paddle. In general you need to be a bit more attentive when you’re SUPing on a river as the current will keep you moving even when you’re not actively paddling. When you’re pushing your limits, on a more technical section, expect to fall more often. That’s part of the fun and challenge of paddling whitewater! 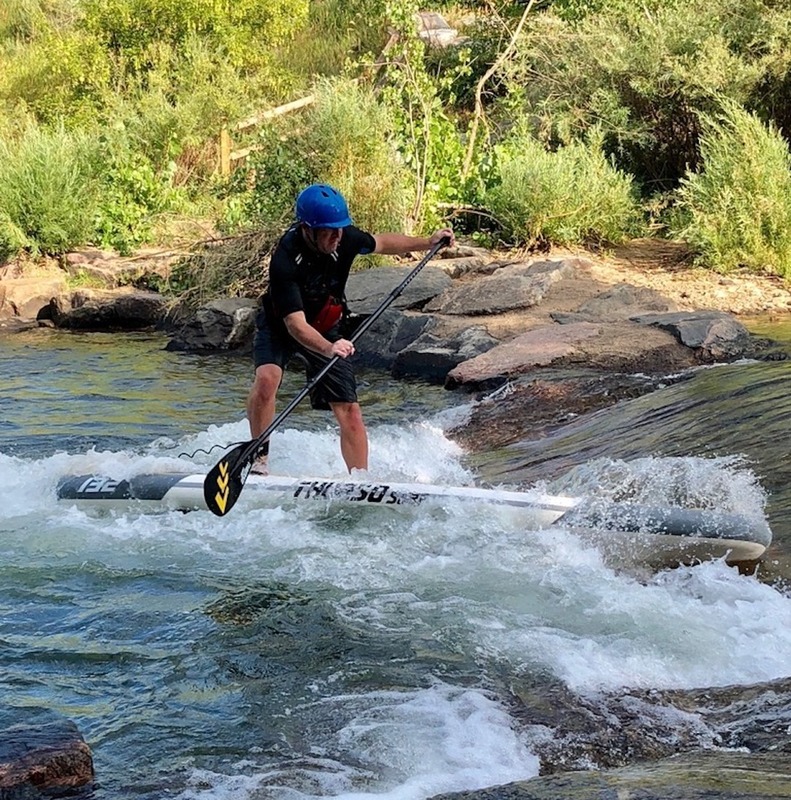 📸 Sean Ryan tackling some whitewater on his Waterwalker 132. Choosing a board for river paddling will depend on the type of paddling you’re planning to do. A touring shape like the Expedition will be fine for relatively flat water. If you plan to encounter more technical sections or rapids, a shorter board like the Waterwalker 126 with its rounded nose will be a bit more stable and easier to maneuver. Because you’re riding with the flow of the river stability is key, so even a wider board like the Tranquility could help you maintain your balance while navigating the currents and obstacles found there.